Stephen Hamilton’s most recent Instagram posts, documenting his work on The Founders Project, involve a lot more effort than choosing a filter. The 31-year-old Roxbury native behind @theartofstephenhamilton reimagines Boston Public High School students as the ancestors of West and West Central African groups — on hand-woven, hand-dyed textiles and hand-carved wood frames created in precolonial West African tradition, no less. Hamilton started the multidisciplinary art installation project earlier this year; the artist spoke with the Globe about the project, public art, and education. Q. What inspired The Founders Project? A. I’m really interested in creating artwork that talks about the cultural connections between the African diaspora. I’m very much in love with mural arts — I grew up in Boston, so I saw the work of Gary Rickson and Paul Goodnight and Dana Chandler and all of these other artists that were associated with the Black Arts Movement in Boston that’s very much part of my historical upbringing as an artist. I was also very much inspired by the work of John Singer Sargent, his murals in the Boston Public Library. I also love African textiles. I feel like public art and my work can be a conduit for education about the art, culture, and history of Africa and how it relates to members of the African diaspora, so that’s the inspiration for the project. I wanted to create a work that sort of dealt with this idea of black identities, founders, and prophets. I wanted to create something which was influenced by that energy but which was also very much in line with work by black artists, black muralists in my neighborhood. Q. Do you consider Instagram to be an extension of public art? A. Very much so. The idea is to use Instagram, and to use social media, to spread awareness about the project but also to introduce people to that work and that visual language. The idea is to get people excited about this project, to spread awareness about it. But it’s also about finding ways to educate people about who these [founders] are. Q. How does your art incorporate education? A. 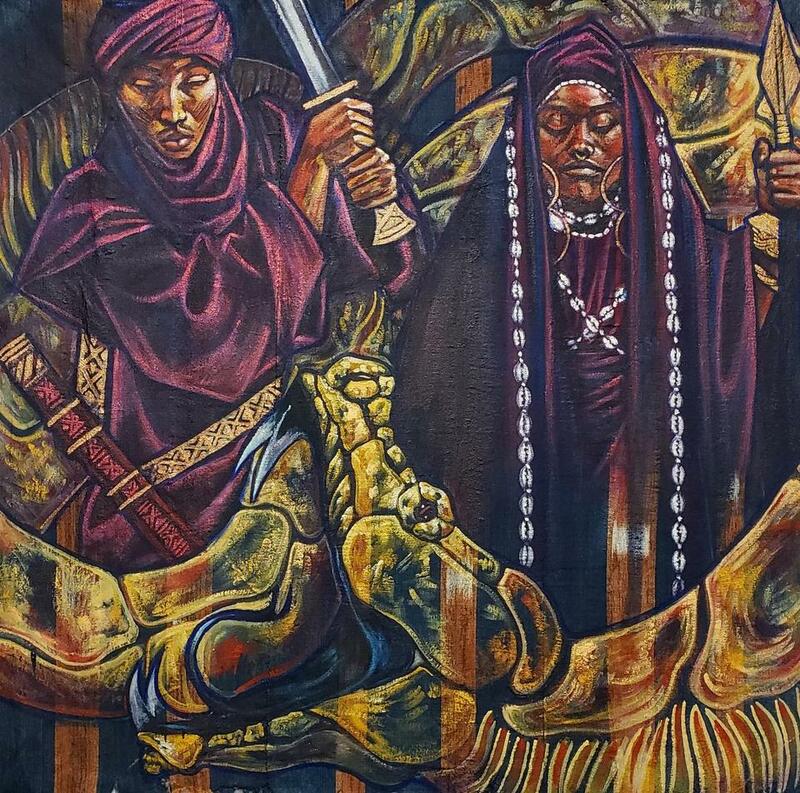 Each of the installations is going to be part of a larger syllabus talking about the art and history of West and Central Africa and its relationship to the African diaspora. The narratives around these figures are placed within the cultural context in which they lived, their contemporary cultural context for people of these different ethnic groups, and also how that entire cultural experience and that entire relationship between the founders and their native cultures also influences and impacts cultures in the African diaspora [today]. I wanted to create something which spoke to our place in history, our place in the ancient past and find a place where I can create visual connections between that and precolonial Africa. I wanted to talk about black history, which isn’t often discussed in public school education, and to talk about a history that extends beyond slavery and Jim Crow. Q. Do the pieces combine the historical stories of the founders and the personal stories of the students? A. I wouldn’t go so far as to say that they’re also representing the personal narratives of these students so much as say that the power and strength that exists within these figures, and the agency that exists in these figures, exists within these students today. The idea is to use these high school students as models to show how that energy continues to inspire communities, but also to highlight the factors of that energy — like thinking about the reclamation of black identities and black bodies, subverting negative tropes that people have about black teenagers. I want these images of these young people to highlight and capture the power and strength of these ancestral figures. I want to paint them as manifestations of that power. Interview was edited and condensed. Kaya Williams can be reached at kaya.williams@globe.com. Follow her on Twitter @Kaya_Noelle.